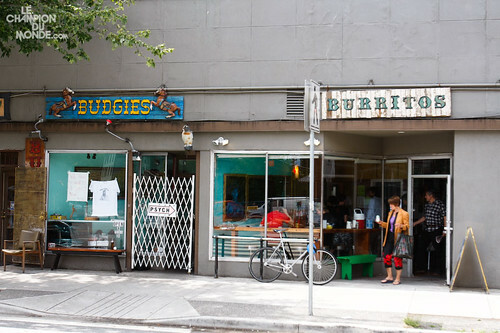 Budgies Burritos is a vegetarian burrito joint on Kingsway near where it splits off from Main Street, at about 8th Avenue. It expanded a couple of years ago and now offers a downstairs area with tables; recently they got licensed and are now selling alcohol as well. They offer burritos (my favourite), tacos, chips, and some other items too – but I always, always get the burrito. When you order a burrito vegan at Budgies, they sub fresh, delicious guacamole for the normal cheese and sour cream. Having accidentally ordered a non-vegan burrito, I can say that they are better vegan.The freshness of the guacamole really makes a difference. My favourite burrito is the Jame-Dog. It’s garlic potatoes and it’s delicious. The chipotle tofu is just marinated chunks of tofu and it tastes like… tofu. It’s firm tofu with a good texture, but I wish it were fried or roasted. The Tofurky burrito contains Tofurky sausage, which I’m not a personal fan of, but if Tofurky rocks your boat then I bet this is a great burrito. They also added a ground round burrito to their menu that I haven’t tried. 10″ Vegan Jame-Dog on whole wheat with refried beans and mix salsa (all three). I definitely think that they should have breakfast burritos, of course with a tofu scramble option. And if they were to crumble their chipotle tofu, marinate it in the same sauce, and then panfry it a bit, it’d be about ten million times better. Still, this is a reliably cheap and delicious place to get a burrito that will fill you up and give you the energy you need to continue being a vegan warrior. For $7, you just can’t beat the amount of food that comes in one of those. This entry was posted in Restaurant Reviews, Vancouver on August 29, 2010 by malloreigh. Pssst… The Perch is now selling 5lb bags of shredded Daiya in both mozzarella and cheddar for $40 including tax – that’s cheaper than Karmavore, and there’s no trip to New Westminster required. 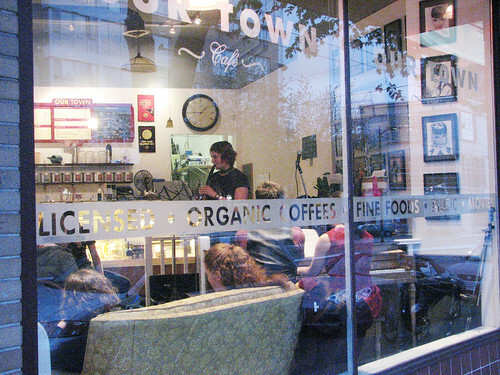 The Perch is located at Commercial Drive and Powell Street in Vancouver, BC – it’s the cafe in the ARC building. They also serve vegan and gluten-free food along with non-vegan and gluteny food, coffee, and alcoholic beverages. Kaylie is their new vegan chef (yay Kaylie!). Here’s a Google map of the location. NOTE: The Perch is open Monday – Friday from 9am to 9pm. This entry was posted in Product Reviews, Restaurant Reviews, Vancouver on August 19, 2010 by malloreigh. This entry was posted in Restaurant Reviews, Vancouver on August 16, 2010 by kaylie. Best thing? The Cambie offers a little-known burger-and-a-beer special. It used to be $5.50, and I think it might be $6.50 now. You get a burger (no fries) and a cheap can of beer, but for another $1 you can usually get the bartender to upgrade you to whatever beer is on special that night. We always hit it on Mondays when Granville Island pitchers are $10 and pints are $3. Sure, the lines at the Cambie haven’t been cleaned since 1974, and yes, you will be gassy and miserable the next day, but you’ll get fed and watered in great company. Unfortunately, The Cambie just changed ownership (or management) and they’re assholes about letting you write on the tables. In fact, we were told by our young server (an SFU student) that if we wrote on the tables he’d have to stay late rubbing it off with a powerful chemical solvent. Seriously?! This once lovably grungy Vancouver institution is trying to match the rest of Gastown in gentrification, perhaps forgetting that what we love about it – what’s kept it hopping every night since I’ve lived in Vancouver – is that it’s NOT an uptight establishment. It’s disgusting, it’s a dive, and we love it. P.S. If you’re planning to come visit Vancouver some time, The Cambie is also one of Vancouver’s longest-running hostels. It’s a rowdy, run-down place in the heart of Gastown. If you’re not too worried about quiet at night and you’re fairly social I might recommend The Cambie experience. This entry was posted in Restaurant Reviews, Vancouver on August 4, 2010 by malloreigh. 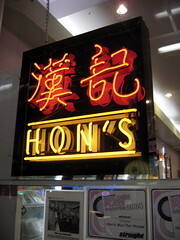 The Robson Street HON’s has a vegetarian kitchen. Hurrah, right? Well, maybe. The place is a giant cafeteria with weird noises and fluorescent lights. The service isn’t bad, but unfortunately, the food is. I’ve been there a total of four times and each time I visit the food is overpriced, bland, and filled with rehydrated mushrooms instead of anything worth eating. The vegetables are obviously frozen-and-boiled or canned, with very little texture or flavour. The faux meat is scarce. I can’t believe I paid $11 for rice noodles, dried mushrooms, and 3 pieces of hydrated bean curd. The spring rolls are okay, but it’s hard to go wrong with deep fried wheat product. Their dim sum is passable – if you get there during lunch hours. Honestly, if you’re on Robson and you’re wondering where to get some vegan food, skip HON’s and walk 1/4 of a block further to White Tower – a Greek restaurant that’s been around forever and is open until 3am on weekends. They have some of the most incredible homous I’ve ever tasted, and they serve it with fresh, hot pita, kalamata olives, and cucumber. Other than homous, their vegan offerings are pretty pitiful (there’s a vegetable pasta that’s vegan-friendly and is okay, but not incredible) – but truly – the homous is worth a visit. Especially late at night after you’ve had a bit to drink. This entry was posted in Restaurant Reviews, Vancouver on July 26, 2010 by malloreigh.